Earlier we rounded up the soon to be available new 9th gen desktop CPUs announced by Intel yesterday evening. Now it's time to look forward to what's in store for later in the year, and/or beyond. In its presentation Intel briefly discussed the likes of 10nm Ice Lake processors, hybrid 10nm Lakefield CPUs, and Project Athena laptops, as well as other non-PC-centric specific stuff like automotive, IoT, sports, AI, networking and 5G, etc. Ice Lake is the code name for Intel's first volume 10nm PC processor family. The processors will deliver a new level of integration and be based upon the Sunny Cove architecture (previously unveiled at the recent Intel Architecture Day). 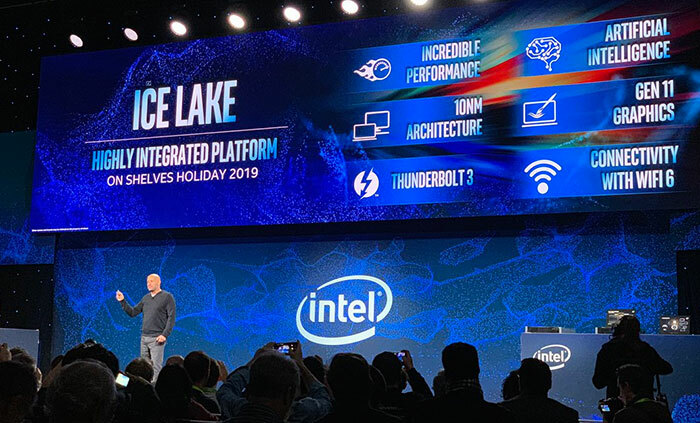 Other aspects of Ice Lake it is worth highlighting are its Intel DL Boost instruction sets to accelerate AI workloads, and the integrated Intel Gen11 graphics to improve graphics performance (>1TFLOP) and support Adaptive Sync (FreeSync). The platform integrates Thunderbolt 3 and the new high-speed Wi-Fi 6 wireless standard. Ice Lake device battery life will be stellar, according to Intel, and prospective buyers will also benefit from super-thin, ultra-mobile designs with excellent responsiveness. The first Ice Lake products are going to be laptops and similar and they will become available in OEM partner devices in time for Xmas this year, Intel hopes. 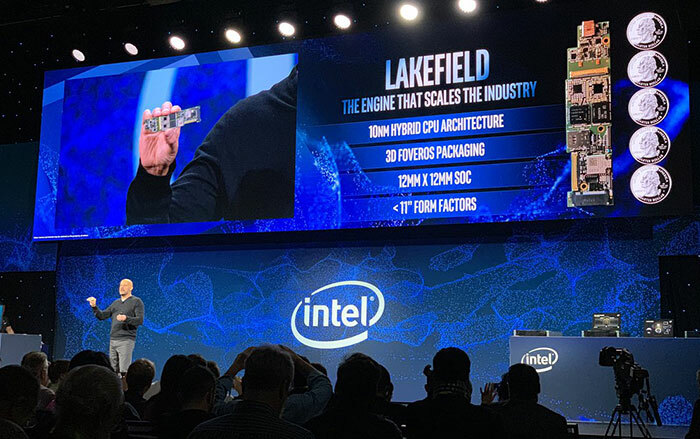 Lakefield is a new 10nm client platform from Intel that features a hybrid CPU leveraging Intel's Foveros 3D packaging technology. Foveros was also talked about last month at the Architecture Day, but to recap it combines high-performance, high-density and low-power silicon process technologies in a 3D packaged chip. In the first Lakefield chip there is a 'big CPU' plus four 'small CPUs'. Specifically at CES 2019, Intel said that the high performance CPU core would be a Sunny Cove core, with four Intel Atom processor-based cores working as the 'small CPUs'. Also on chip we have graphics and other IPs, I/O and memory. Intel showed off a tiny motherboard featuring this tech, as pictured directly above. Again it is a great choice for thin and light devices with long battery life and modern connectivity. Lakefield devices are expected to debut later this year and would naturally fit in the portable device product range somewhere below Intel Ice Lake portables. 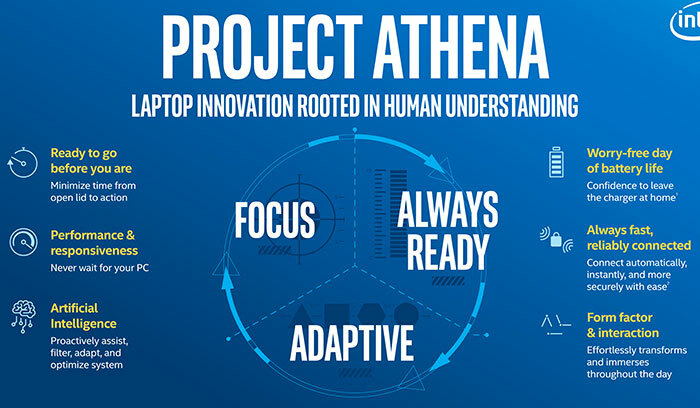 Lastly, but likely to be seen before the two platforms mentioned above (estimated H2 2019), Intel talked about its Project Athena laptop plans. To me it sounds like an outline for Ultrabook Mk2 - but updated on a yearly basis. Intel shared the following bullet points to describe its new program which will push the adoption of 5G and AI technologies in its first year. Though it’s a bit vague, and perhaps just an exercise in branding to combat AMD mobile, Intel has ready-and-willing big-name sign-ups including Acer, Asus, Dell, Google, HP, Innolux, Lenovo, Microsoft, Samsung and Sharp. One thing that is worrying about their chatting of 10nm is the large amount of “stellar for mobile”, “great for battery life” and “low power for better mobile performance”. Yeah, there have been rumours (not that they are worth anything) that Intel's 10nm, the current version they are working on, has issues with high clock speeds. So I can see why they would be targeting lower power devices this year with the process, as that may be the process's sweet spot, until Intel work out the performance issue (maybe they have already). HVM today for Q4 2019 release sounds fishy to me as well. “Rooted in human understanding”?! What utter tripe is this? Interesting, good to see some official announcement on 10nm at least though. Sounds like its going to be another 12-14 months until i'll be able to buy one though which is a bit of a shame - looks like i'll be sticking with my 6700K for another year then!